During our road trip we drove along the border of Jordan. When you look at Google maps, there is a big chunk of the country with a dotted line border, right along this border of the country. 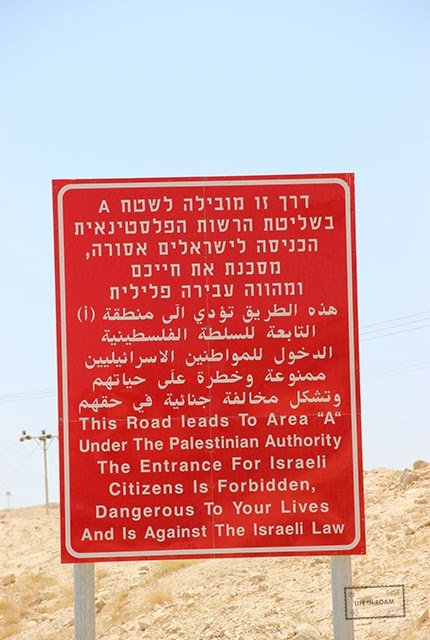 This land is contested territory, along with the Gaza strip in the south of Israel near Egypt, between the Israel government and the Palestinians. When we were with Jeff’s coworkers, I tried to ask if there would be trouble for us driving through this area – there is very little information about it online. They seemed to think it would be fine, because we weren’t israeli, but didn’t leave me feeling completely reassured. It turned out fine, there are plenty of red signs to tell the unknowing driver when they’re about to enter a place they shouldn’t. And as it turns out, Americans are not the ones who should stay out anyway. All I knew about the Israeli Conflict was that America was helping Israel, there was some conflict with the Palestinians, but the Palestinians were a faceless people to me. With the help of wikipedia and Joe Sacco’s Palestine, I’ll try to explain some of the situation. From what I understand, Palestine was a country occupied by Britain after WWI. Then, during WWII and just after, there was a civil war in the country, and during the WWII the nazi’s used a railroad through the country to transport supplies. 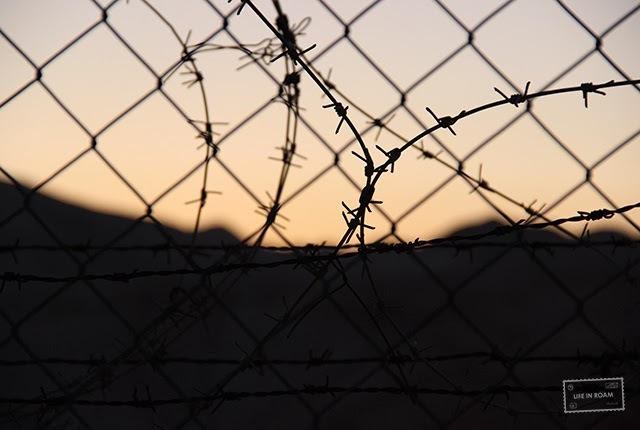 These factors lead to the decision that 100,000 refugee Jews will be relocated to Palestine, and the country will be reformed. This area eventually became known as Israel, and was supposed to have arab and jewish states. These sections are what the conflict seems to primarily be about, acknowledgment of borderlines, access to water, and most contested: Jerusalem. Jerusalem is hotly contested because it has important political and religious meaning for both groups. 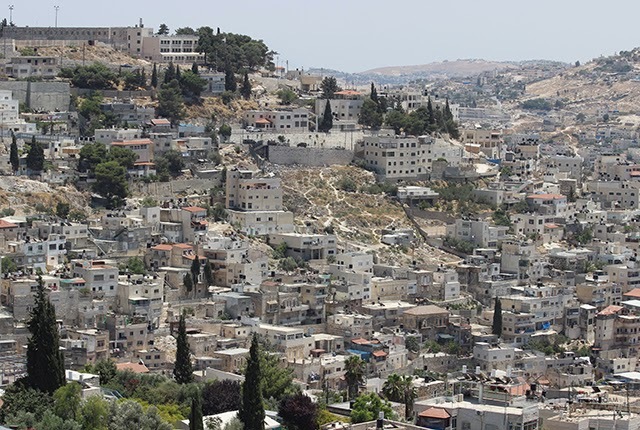 There are jewish and arab sections of the city, and officially they both have ownership of the city. Realistically though, this isn’t true. 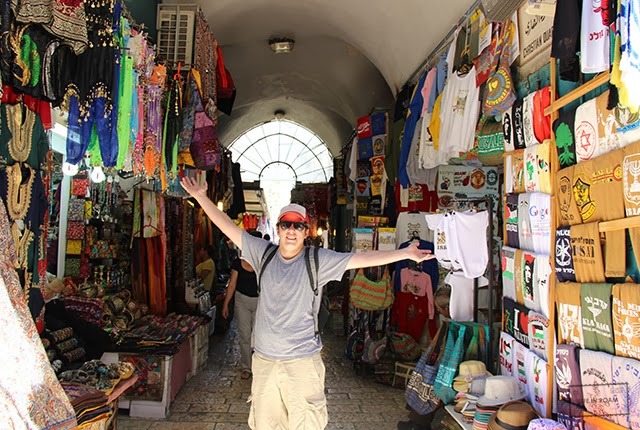 Through various points in history, the arab population has been moved from one part of the city to another, in order to make room for Jewish wants (access to religious sights, for example). 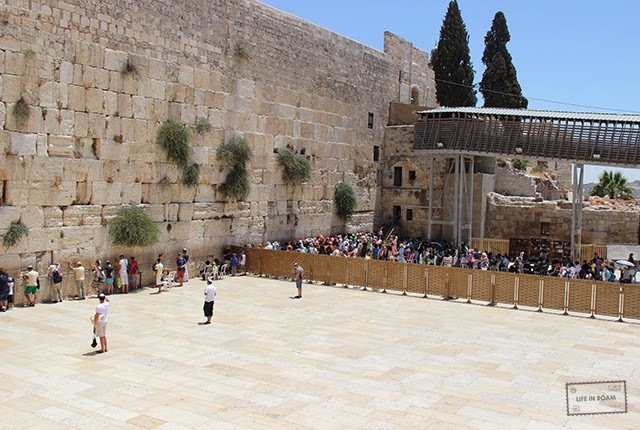 The Western Wall, with separate sides for men and women. 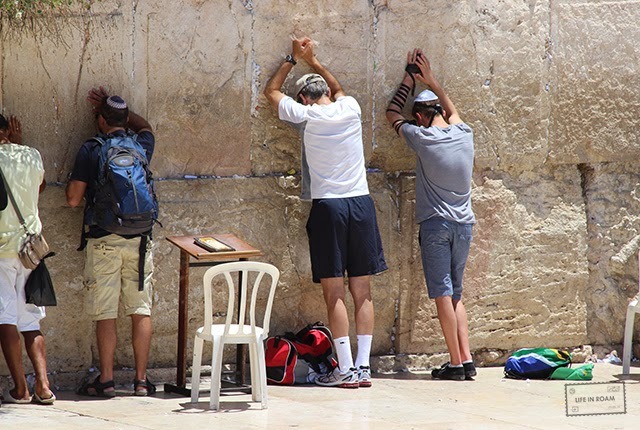 The Western Wall, two men praying. It’s also called The Wailing Wall. The Western Wall and the Dome of the Rock are located close to each other, and from them stem a lot of conflict. The Dome of the Rock is valued by Christians, Jews, and Muslims. 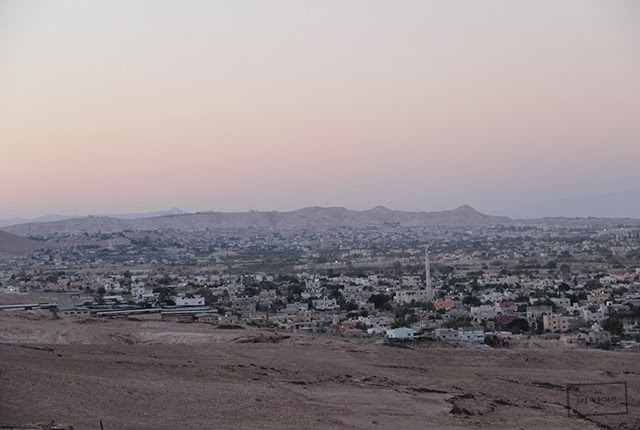 Islam believes that this is the location that Mohammad ascended to heaven. Judiasm believes it to be the spot where Abraham was about to sacrifice Isaac. Christians believe that Constantine’s mother built a small church which eventually became a Church of Holy Wisdom. Today, from my understanding, the Arab quarter has the Dome of the Rock, and they refuse entry for Jewish citizens. Thus, the Jews pray at the Western Wall, the closest they can get to the Dome. To be clear, the Western Wall itself is also of significant importance, it just also happens to be the closest sight to the Dome of the Rock. 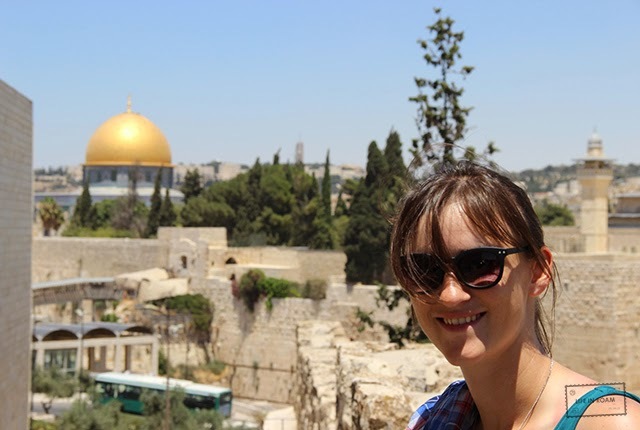 In the background, Dome of the Rock. The most contested piece of real-estate on earth. It is valued by Christians, Jews, and Muslims. The issue I have with the Palestinian and Israeli conflict are the ghettos that palestinian people have to live in. Most of this information comes from Joe Sacco’s Palestine. To me it seems that the Palestinians are put in a no-win situation and expected to be content. They live in fenced-in communities, working outside is very difficult because they have to obtain a work permit, businesses are either destroyed or put in second to Israeli business (time-sensitive crops delivered after all israeli-family crops are sent), and there are israeli soldiers patrolling and enforcing curfews. This isn’t to say that their are not “successful” Palestinians, there certainly are. There was a story from one in This American Life recently (click here for the transcript, it’s Act Three). It just seems so hypocritical to me that an “oppressed” culture, like the jewish, are suppressing another culture. 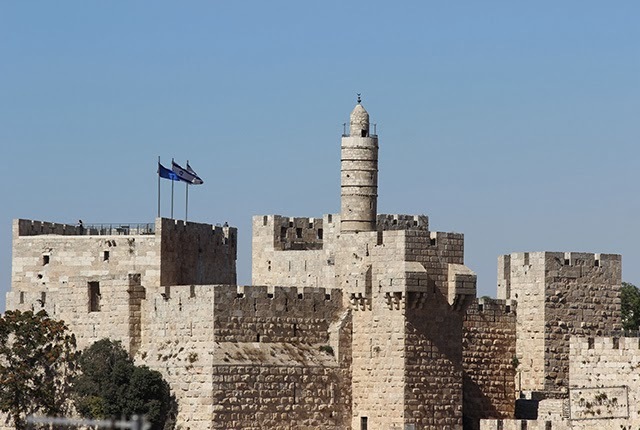 A picture of the Old City and the tower of David. And who am I to judge? I’m an agnostic, white, kid from the “best country on earth.” What do I know about sacred lands and conflicted people? I’m sure I don’t have the Israeli story, but I am not convinced that anyone really does. When mixing political and religious motivations of two (and more) groups, it isn’t going to be easy. I just have my own opinion, which I try to be rational about, but at the end of the day, it’s really none of my business. 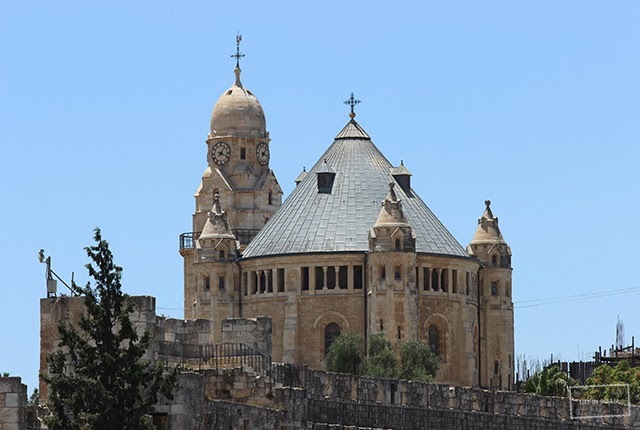 Dormition Abbey on Mount Zion, a roman catholic church. There is another thing I have to say about Israel, but not in reference to Arab-Jew relations. Just a general statement. As a preface, I haven’t travelled to many places on a global scale, but I have seen quite a bit. I love animals, and when I travel I will pet most strays as long as they don’t look like they’ll bite me. In India, a place with tons of poverty, a stray may avoid you but they don’t look scared. In Turkey, the stray animals are extremely friendly, even in the country-side. In Israel, the stray cats and dogs looked terrified of people. If I made eye contact with them, they would bolt and hide. Maybe that’s a silly thing to make an observation or judgment about, but I think it’s worth noting. Israel turned out to be more interesting than I had thought it would. I think if someone has the opportunity to go, it’s absolutely worth it. The country is a big giant desert, but the coast has nice beaches, and the food is really good. The must-see for me was definitely the Dead Sea, it’s hard to experience anything like that. Inside the big network shops in the Old City markets. Fun to walk through, be warned the salesmen are mildly aggressive.